We met Ike last night. He was not a very nice dude. All was well until we lost electricity at 1AM Saturday morning. We gathered our flashlights and moved ourselves into the guest room so we could be right next to the babies, just in case. The winds started to pick up at about 2:30am and neither of us were able to sleep all night. 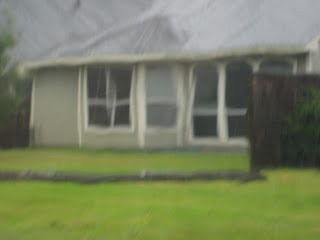 The wind was whipping around the house and trees, causing the house to creak, and pelt the windows with rain. The eye wall hit us hard at about 6AM while we fed the babies by candlelight. It was so dark outside we could not even see the trees out of the window. We tried to stay home until power came back on, but the air was so still and humid afterwards that, even with the windows open, we were all sweating like crazy and the babies were so cranky. So we packed up the car and loaded the babies to head to Austin to stay with my sister. Oh, how nice to have A/C and a warm meal. My mema and pepa are in Austin as well and are unsure of the condition of their home. 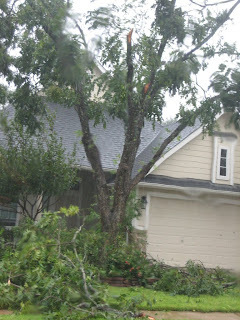 My mom stayed in Texas City and had no damage to her home, except for a few fallen tree branches. As Brian and I were watching the news last night we were thinking of you and wondering how you were doing. Good to see you are safe and warm. Our thoughts and prayers are with you and the rest of your family. Glad to hear that you are safe. I was worried about your Mema and Papaw when I saw the flooding in Galveston. Relieved to hear from you. Hope your property didn't sustain any damage. We're feeling some of the effects of Ike in KS with TONS of rain. Not good on the ol' basement. A candlelit breakfast isn't nearly as romantic as it sounds. Glad to hear that you are okay. Been checking on you and very worried! Glad to hear you guys are okay. Glad ya'll are ok. My parents lost their fence, but they did get their power back on (they're in Katy). I agree that the candlelight breakfast is no fun! Hope your stay in Austin is short and glad ya'll had no damage! We had barely anything up here in Plano. oh, praise God that you guys are safe and sound! it's good to hear all of you are well. Let me know how long your going to be Austin. Remember we are in Round Rock. Near the outlet mall. Would love to visit. 986-5777. So glad you guys are ok. I was worried about you. A/C is the best...how did anyone ever survive without it??? Glad you are all safe. I couldn't help but think of you guys too (from over here in Cali). I hope the rest of the family is well and has minimal property damage. Ike wasn't nice, was he? Glad to hear you are all ok and safe. How did Chris' grandparents fair? Glad ya'll are safe and have AC right now. Hang in there and be careful! Glad to hear you are all safe! 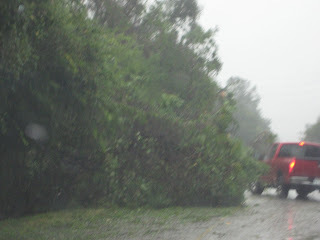 I hope your power comes back on soon... and glad to here yu'all had no big damage. Was so happy to hear from you that all were safe and sound! People are more important than power - but I am thankful that ours came back on 30 minutes ago!! Now back to more clean-up. Much love to all of you.